The trend EA that uses the principle of price roll-back in case of a strong initial movement. It differs from the ReversionFinder by a more advanced filtering system. It opens only a few trades. The smaller the spread, the better. No martingale. Attempts are made to close the unprofitable deals at the expense of the profit of previous deals. In case there are other deals opened on the account, or if they are opened manually, it will automatically close them once the profit is reached. It shows more confidence when there are two-three other instances of the EA working on other currency pairs. Precision of quotes: Any (both 3/5-digit and 2/4-digit quotes). When using 2/4-digit quotes, the TrailSize value should be decreased 10 times. LotSize - lot size (0 - automatic calculation of the lot size based on the balance). TrailSize - dynamic stop loss in points. Used to get the maximum profit from each deal. BuyEnable - use BUY orders in trading. SellEnable - use SELL orders in trading. Risk - deposit usage percentage (1-99%). The parameter affects the lot size if LotSize=0. Backtests with the default settings on the EURUSD and GBPUSD pairs on the M30 timeframe show a profit factor of 20-25% per month. Optimize the parameters (BuyEnable, SellEnable, BoundFilter, SizeFilter) according to your broker - the default settings are not always profitable. Updated the trade logic. 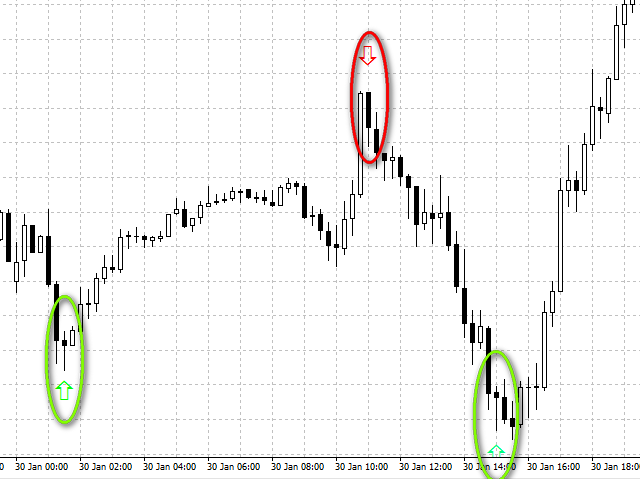 Trading is performed on multiple timeframes (M15, M30 and H1).